The main two key drivers of the emission’s legislation regulations are the EU Ecodesign and US pump efficiency regulations. The Ecodesign rule first focused on removing the bottom 10% of pump efficiencies. The next regulations were stricter with removing the next 40% of pumps in terms of low efficiency. Both of these regulations focus on efficiency over the wide operating range and not just at your design point. For example, if you take the efficiency curve for a pump in the new regulations for Ecodesign, you would create a small improvement at the design point but flatten the efficiency contours. This will produce a considerable improvement in your off-design performance and overall Ecodesign rating. Improving off-design performance and ‘flattening’ the efficiency envelope is a difficult task even for experienced pump designers. To improve the design–manually, requires producing many iterations via trial and error to try to find how you can improve the performance across the operating range. 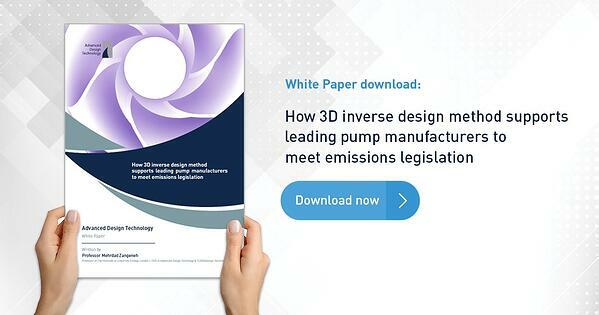 In this paper, we will show how by using inverse design based automatic optimization, pump stages can be rapidly designed to achieve improvements in efficiency at multiple operating points and hence meet the different emission legislation. The key drivers of emission's legislation regulations. The advantages of 3D inverse design based multi-point optimization for pumps to improve performance efficiency by up to 4 points. TURBOdesign Optima DoE design process to control 3D blade geometry. Case Study: How TURBOdesign1 enabled Hyosung to achieve a significant hydraulic performance improvement in a short period of time.